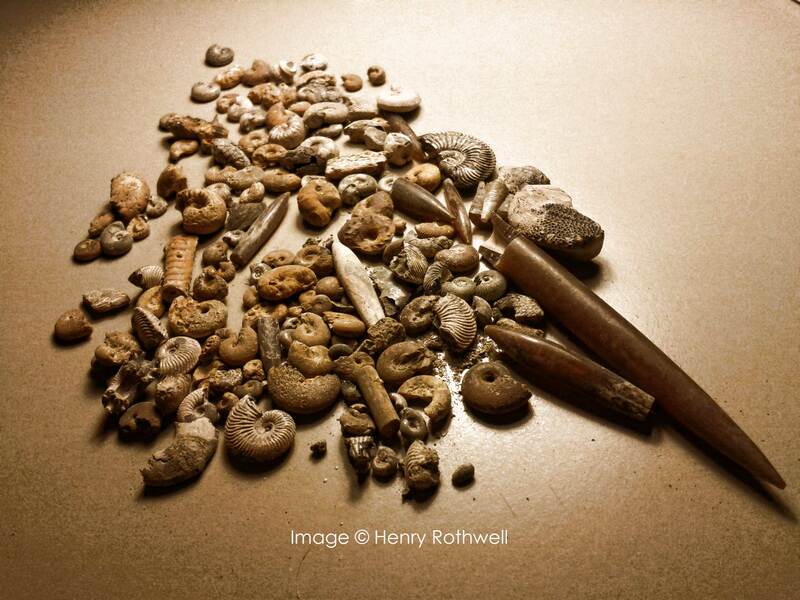 I collected these fossils with a friend of mine, John Buchanan-Brown. 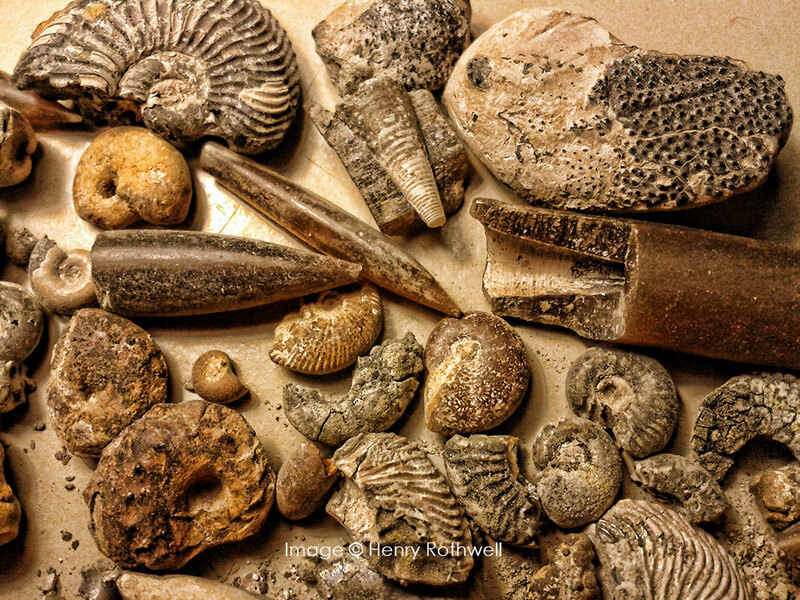 John somehow knew where all the best fossil collecting spots were – perhaps it was something to do with a geology degree and the fact that he frequently went looking for them. We had often spent days in odd places, sifting through the bits of quarries no-one else seemed interested in, and occasionally finding treasures our childhood selves would have goggled at. That we goggled at. But the place he took me to on the day we found the Pearlescent Ammonite Mountain was, if not the oddest, then certainly the most unpleasant. Our species is not without the occasional stroke of inventive genius. The Internet is an obvious example, as is the paper-clip, penicillin, paper, the NHS (version 1.0), zips, kebabs, aquariums. . . the list is virtually endless and, of course, right up there in the top ten somewhere, includes lists. It also includes our solution to the phenomenon of conspicuous consumption. Got too much food/clothing/packaging? Don’t worry – we’ll dig a big hole, throw it in, then bury it. Problem solved. Oh – you have more? Don’t worry. We’ll never run out of holes – we seem to find them almost everywhere we dig. It’s amazing. One drizzly, blustery morning, John and I found ourselves standing in what was formerly some Wiltshire countryside, but was now a vast plain of black Kimmeridge Clay, chosen by the authorities as a prime landfill site for its impermeable qualities. This was divided into cells, into which rubbish could be tipped, and if some thing nasty started pooling at the bottom of a cell, instead of leaking out, it would stay there, festering forever. Ironically this indicates that a great deal of thought had been expended on the consequences of dumping rubbish in holes, but not on how to actually avoid having to dump rubbish in holes in the first place. In the near distance they were filling a new cell. These cells, it should be noted, are vast. Down there, spreading and compressing new rubbish, weaving between the steel pipes that had been hammered into the under-rubbish to release large quantities of gas, were JCB-like vehicles that from our vantage point appeared to be the size of Tonka toys. The wheels didn’t have tyres, but were instead large lumps of metal with moulded vanes to aid traction. The only thing that gave a sense of scale were the flocks of gulls following these vehicles, swirling in the rudderless winds, and perpetually broadcasting in piercing shrieks that here, against all the odds, was another bit of interesting rubbish. But in this wasteland was beauty. Without getting too technical, if you dig a socking great hole, then you have to put all the stuff that isn’t the hole somewhere else, and it was here that John said we’d find the best fossils. The mountain of clay was, like us, a little unstable, and the sides were fairly steep, so we couldn’t go clambering around too much without causing a slide which, all going badly, would have meant finding out exactly how big those JCB creatures were, and also becoming the subject of the latest broadcast on the seagull news network. So we measured our pace and spent the morning squinting at a huge pile of clay, looking like the world’s most diligent quantity surveyors (I’m guessing that’s close to what they do), picking little fossils out of the muck and putting the in little plastic bags. 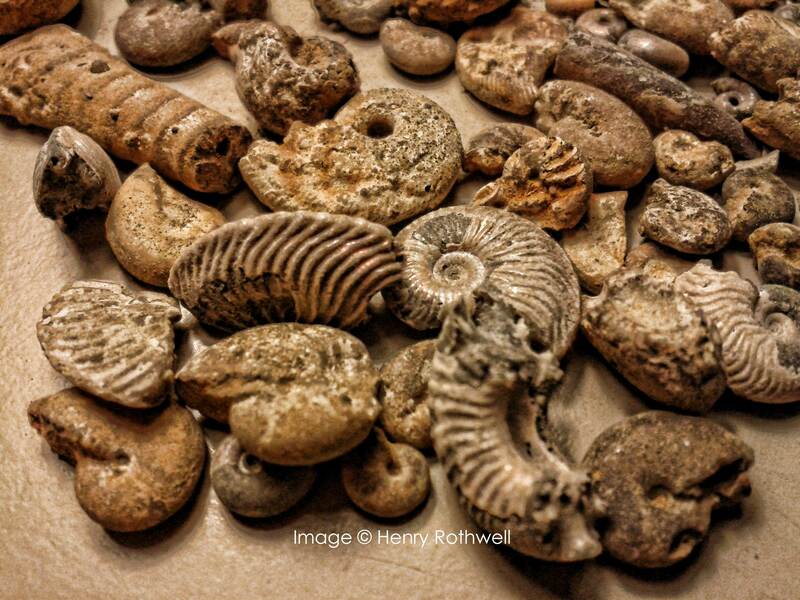 The Jurassic ammonites were tiny, but a fair number of them were pearlescent, so they stood out against the black clay like so many discarded Victorian buttons. The diminutive, slender belemnite spears were harder to spot, but the current drizzle, and the rain of the day before, had given them a slight sheen that separated them from the matte clay in which they sat. The Jurassic crab carapace (or possibly claw – we’ll find out one of these days). In other circumstances we could have spent the day there, but, as so often was the case, we’d brought mild hangovers with us, and all too frequently the wind would shift, replacing the local breathable atmosphere with a pocket of noxious, eye-watering, breakfast threatening gas. This, coupled with the occasional waft of diesel exhaust and the constant noise from the sea-gulls, brought the search to an early conclusion. 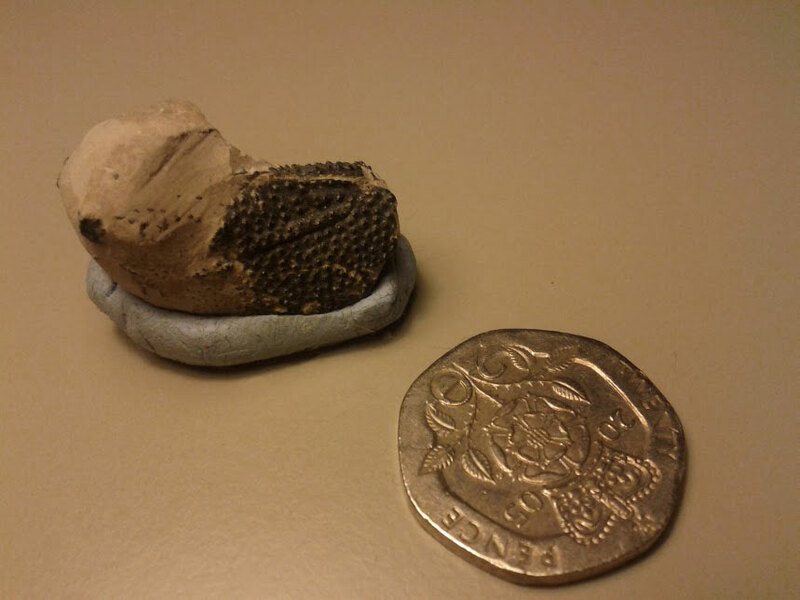 Also I’d found, wrapped in a cocoon of clay, in all likelihood, the carapace of a Jurassic crab. Understandably I was itching to get home and start uncovering my latest treasure. Now, a mere twelve years later, I’m about to start. . .
Next time . . . how we spent the hottest day of the year in an exposed quarry, trying to carry 70lb lumps of Jurassic tree trunk to the carpark before the gates closed. . .